I have a fall wreath that is hung up outside on the house next to the back door. I didn't take the wreath down and change it out with the Christmas wreath this year, I just left it up. I noticed one day that a cardinal was flying in and out of the wreath. I didn't think much of it at the time, but a few weeks later I heard a faint little chirp coming from the wreath. I stood up on a chair and peeked in the wreath and saw 4 little balls of fuzz all huddled together! I knew then that the cardinal was making a nest and calling the wreath her home. As days went on I peeked in the nest seeing the day to day changes of the babies. After about 2 weeks the mama was making her daily visits to feed her babies. 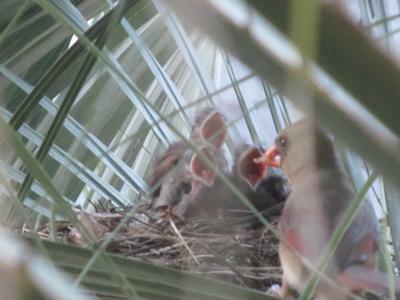 It was so fun to watch from a distance, seeing the babies mouths wide open just hungry as can be. It was even more interesting when sitting on the patio right beneath the wreath and seeing the mother cardinal in the tree "talking" to us. 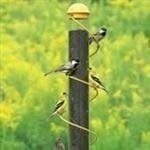 We thought hmmm, is she telling us to get off the patio because it's feeding time now? Was she being protective because we were so close to that wreath? She really chirped up a storm! After we went into the house I went to the bedroom window that looks out to the wreath and low and behold, the mother went zooming into the wreath to check her babies! It was so interesting to watch and see how they care for their babies. Just last night we were looking into the nest and two of the four babies were left. Clearly two had left the nest and the two remaining had a look on their face that they were ready to fly too. 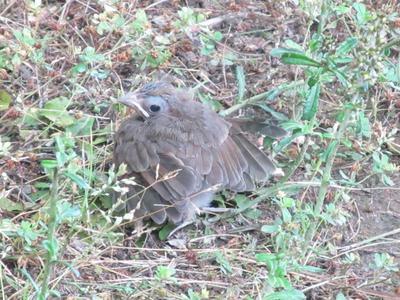 I started to make some chirping noises and they chirped back and about 30 minutes later, there went one of the babies! Now there was one left. It started to thunder and rain so we went into the house wondering was that last baby going to leave the nest too? This morning the sun was shining bright - It was a beautiful cool Spring morning and when I left to go to work I peeked in the nest and it's empty! I really enjoyed the time that I was able to see the start of the nest building to the babies flying off to start their life! Today we heard a loud thump, something hitting the front door. 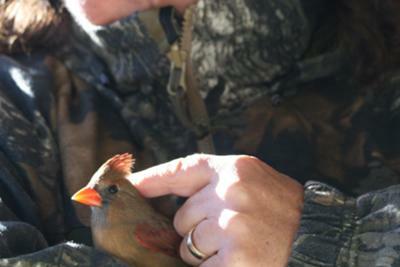 As my husband Terry went to investigate, he discovered a little female cardinal had hit the glass on the front door. He picked the cardinal up, she seemed a little disoriented but not injured. After several minutes of petting her, he handed her to me and I started stroking her. (I think she was enjoying the attention.). After several minutes had passed, she was able to fly on her own. She headed for the front tree. I checked on her to make sure she was ok. She was able to join the rest of her family. She seems fine. Today was a good day. 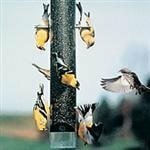 See Cardinals and Windows for more information on this behavior. Hi everyone. This is going to be short and sweet.....And sweet it is....I just couldn't resist sharing this with ya'll. As you know I take pictures everyday. Yesterday seemed like a Robin and Cardinal day. So here comes a beautiful Cardinal...As I captured this picture, it made me laugh out loud...How much funnier can a bird be. You know they are always up to something, jumping on top of each other to move them away, flying into each other, bopping around on the ground. I hope ya'll enjoy this one, I doubt I'll even see another one. Hope this makes you laugh and makes your day...It certainly made my day. I live in the hill country of Tx. where the springs are long and the winters mild. Except for this year, I have lived here for 25 years and this year is the first time it really snowed for a whole day. Of course it did not stay on the ground for a whole day, but it stayed long enough for pictures. 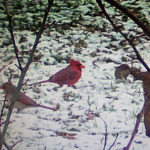 I have been telling stories about the Cardinals that have made my yard their home and this is the on going story of the boy Cardinal that was born in my very large oak tree. We have named him the prince of sparrows for a very good reason. Ever since he was a kid he would hang out in a large bush that was the home of many ,many sparrows, for what reason he did this I am not sure, maybe he was lonely. Now all grown up, he still hangs out with them or they are hanging out with him . Wherever he goes there are always at least 3 to 5 sparrows with him which seemed to suit him just fine until he took a mate. She is a very nice well brought up lady, who has tried to understand his way of life. Where she comes from, nice Cardinals don`t hang out with sparrows but love is strange and she has learned to except his wayward ways and his friends. Today our school had a field trip-to our backyard. In fact as the day has gone by it has become our classroom for most subjects. 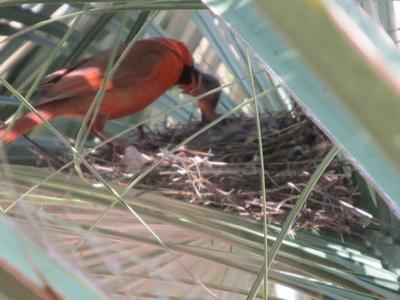 For several weeks we watched a soon to be momma Cardinal build her nest and to our joy we soon heard sweet, high pitched chirps above our heads in our Date Palm Tree. My two children have greatly enjoyed watching the mom and dad take such good care of their brood and this morning we were able to make it out in time to see the last one in it's nest. We've had great concerns regarding two neighboring cats, and, in fact, during our devotions under the palm tree this morning we watched as the mom and dad cardinal flew over our gate and into a tree over the driveway. My son was curious so he opened the gate and to his horror one of the cats was batting around a robin near the tree! A rescue mission ensued and the poor robin eventually, with it's sliced up back, was able to hop into our front yard and fly into the tree there. We immediately went back to guarding our backyard, with schoolwork in hand, sorting out mixed fractions while keeping a keen eye out for a cat prowling for the babies (who had made their way to our brush pile). 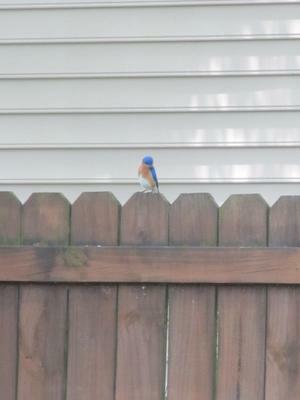 As of this writing we can now only see one baby and it ended up getting a beautiful bluebird to come sit above and watch it on our privacy fence. 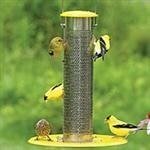 We will be praying for the little birds to make it in this suburban cat playing field which has become our classroom of appreciation for God's amazing creation! We give Him an A-Plus! So there's this cardinal that nests in my neighborhood each year that returns with his mate. 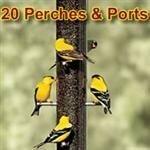 I don't remember how long the pair has been nesting, but I see the male more often than the female. Keep in mind that this cardinal is one of the many cardinals in my town that everyone likes to say is my high school's mascot watching us. Well the same pair came back this year and the male is one of those types that I like say is a "Pretty boy." I say this because he tends to sit on a mirror in my neighbor's driveway and look at his reflection. He does the same to my neighbor's car but he poops on the side of it. 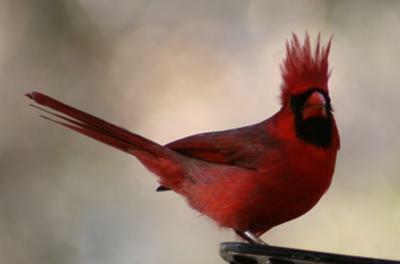 This cardinal did it 2 or 3 years back when my older brother had his red truck. Well last week my school went through a rough patch because we lost 2 people from the school. We lost a student who was a grade ahead of me and we lost a teacher. The teacher we lost was named Douglas Schilling and he was a teacher that helped us get the events we have now and he was considered a true cardinal. Now a lot of people were upset last Friday and part of this week due to the loss of the teacher and the fact that they had to do events for the funerals. One thing that stood out to me the most when I walked home from school Friday, was the male cardinal. I had never named the male or the female before at all until this point. My mom and I agreed to name it after the teacher in his honor and every time the cardinal chirps, I say its that teacher giving his comments to the world. I have yet to name the female and I hope when I see some baby cardinals in the future, that I try and name one of them after the student.